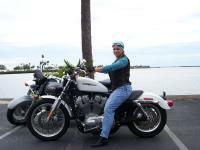 I have an 883 Harley Davidson Sportster X Low I am just 5'2-1/2" tall so I need a shorter ride. It is so Sweet. My husband added a stage one kit to it so it is fast too. I think that it is the perfect bike for any woman. That is a sweet bike. Congratulations.